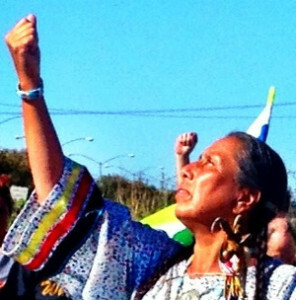 by Pennie Opal Plant, co-founder Movement Rights and Idle No More Bay Area. The Healing Walks in the tar sands of Alberta Canada and between the refineries in the San Francisco Bay area (and in many places on Mother Earth’s belly worldwide) are born out of a need to heal our human relationship with each other and all living beings, the water, air and land, and witness the suffering caused by our destructive addiction to fossil fuels. It is not a rally, a march or a protest, but an acknowledgement of life that helps us connect to our activism and daily life in new ways. 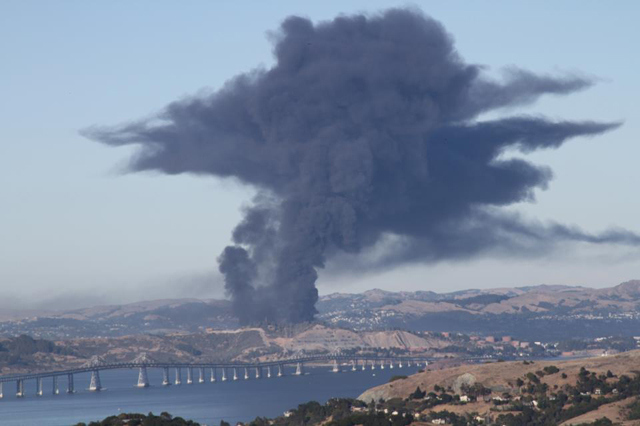 Two years after the refinery explosion that rocked the Richmond, CA community, residents still live in fear, while air quality and land remain contaminated. Most people living in the San Francisco Bay Area are familiar with the Chevron refinery in Richmond due to the many accidents that have affected the health of community members. In particular, the fire on August 6, 2012 which sent 15,000 people to hospitals. What many people are beginning to realize is that there are five refineries in the Bay Area, plus a proposal for the WesPac oil terminal in Pittsburg. The refineries include: Tesoro and Shell in Martinez, Valero in Benicia, Conoco Phillips 66 in Rodeo, and Chevron in Richmond. Many people living in these communities suffer similar health effects which include very high rates of asthma, especially among children, as well as cancers, auto-immune and respiratory diseases. In addition to the health risks from living near these refineries, people living near the railroad tracks are becoming more aware of the crude by rail coming through the Bay Area. These are the same types of oil trains that have been derailing and exploding on a regular basis throughout North America. Trains carrying potentially explosive crude are next to homes, shopping areas, schools, and community centers. The radius of one of these trains exploding is 1 mile. On December 3, 2014, a train derailed next to Peres Elementary School in Richmond. Fortunately, it was not carrying crude oil, but it could have been. In January of 2014, Idle No More SF Bay decided to organize a series of healing walks along the refinery corridor of the Northeast San Francisco Bay. 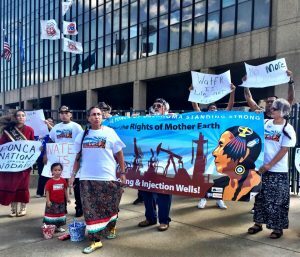 The walks were inspired by the many healing walks and runs in Native America, including the Tar Sands Healing Walks in Alberta, Canada, the Longest Walks, and the Peace & Dignity Journeys. Front-line activists living along the corridor joined them and created the Bay Area Refinery Corridor Coalition (BARCC). 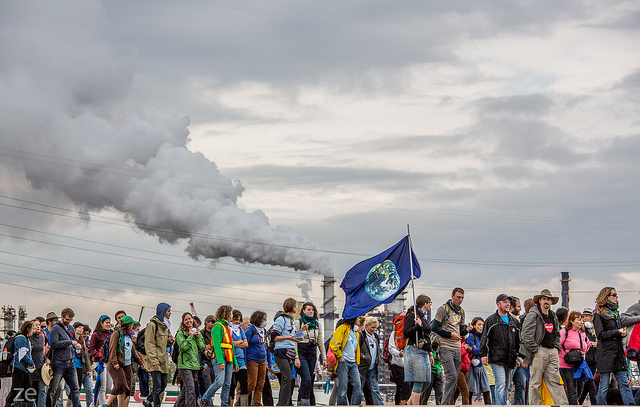 Working together, these two groups organized the healing walks to bring attention to the health risks and dangers that the refineries pose and the explosive crude by rail coming through the communities from the Alberta tar sands and the Bakken oil fields. 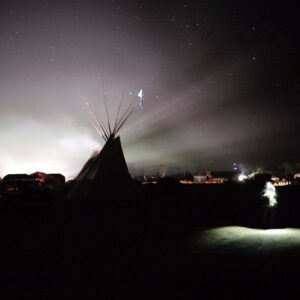 The Walks begin and end with prayers for the water conducted by Native American women, and are led by Native American elders and others in prayer following a sacred staff. Others walk in contemplation and conversation. Walkers stop at the refineries and toxic sites along the way to pray for the land, water and air, as well as creatures living near the refineries and those yet to be born. Support vehicles follow the walkers with water and medics. Participants are asked to sign an agreement to be nonviolent. encourage walkers to envision a just transition to a clean and safe energy future and an economy that supports everyone. Walkers are invited to write or draw these ideas on muslin squares at the end of each walk. These squares will be sewn into quilts. The quilts from 2014 will be shown at all of the walks. Saturday, April 18th: Pittsburg to Martinez – 51 Marina Blvd., Pittsburg. Water Ceremony and registration 8:00 a.m. Walk begins at 9:30 a.m., ending at Martinez Waterfront Park at the end of Ferry Street. Sunday, May 17th: Martinez to Benicia – Waterfront Park at the end of Ferry Street. Water Ceremony and registration 8:00 a.m. Walk begins at 9:30 a.m., ending at 9th Street Park in Benicia. Saturday, June 20: Benicia to Rodeo – 9th Street Park, Benicia. Water Ceremony and registration 8:00 a.m. Walk begins at 9:30 a.m., ending at Lone Tree Point in Rodeo. Sunday, July 19: Rodeo to Richmond – Lone Tree Point, Rodeo. Water Ceremony and registration 8:00 a.m. Walk begins at 9:30 a.m., ending at Keller Beach in Point Richmond. The indigenous women led Idle No More movement began in late October, 2012. Three First Nations women, and one woman who refers to herself as of “settler” descent, decided to call out for people in Canada to rise up for indigenous rights and against proposed legislation that would devastate the environment. In particular, Bill C-45 proposed reducing the protections of natural systems of water (rivers, lakes, streams) from over 2 million to under 200. This bill was ultimately passed by the Canadian Parliament on December 5, 2012. 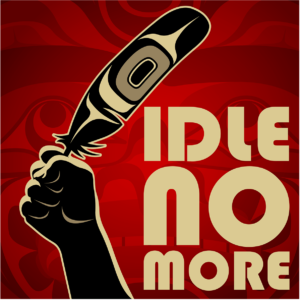 The call to be “Idle No More” resonated nationally with thousands of people coming together to conduct prayers, teach-ins and round dances (dances of peace and friendship) in shopping malls, streets, and public spaces all across Canada. The call to be idle no more also resonated around the world with solidarity actions in North, Central and South America, Europe, Australia, Asia and Africa. Locally, Native Americans and their allies began conducting Idle No More type actions in December, 2012. In early 2013, Idle No More SF Bay was formally created by a group of Native American grandmothers, mothers, fathers and grandfathers. Idle No More SF Bay includes many allies of different backgrounds. 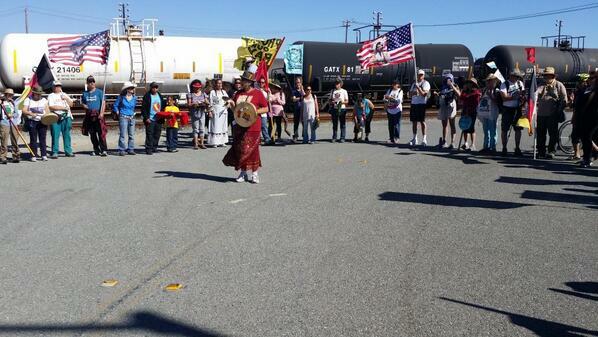 This group has become one of the most active Idle No More groups in the United States. Subscribe to Movement Rights newsletter and keep up to date on our activities and news of community, nature and indigenous rights. Follow us on twitter and Facebook. Previous PostDoes Apple, Monsanto or Exxon “owe” America anything? Next PostCalifornia, Drought and the Return of ‘Limits to Growth’?